Under the watchful gaze of “The Pilgrim” New Yorkers sun themselves. As is the case with many other New Yorkers, I am eager for spring to burst into full bloom across New York City and especially in Central Park. Soon cherry blossoms will paint the Park pink; and the white flowers of the Callery Pear tree will look like warm-weather snow when they fall to the ground. We include these dazzling sights on our Central Park Walking Tour [https://walkaboutny.com/the-tours/central-park-walking-tour/]. Until then, let’s satisfy ourselves with past pictures of an especially pretty part of the Park. The “ideal figure” that the quote from the New York Times is referring to is the work by an American artist with a most curious name, John Quincy Adams Ward (1830-1910). He had no relation to the president who went by those first three monikers. The best possible speculation is that Mr. Ward’s parents must have liked President John Quincy Adams, whose term in office ended the year before Mr. Ward’s birth in Urbana, Ohio. On the east side of Central Park, between 72nd and 73rd Streets, there is a rise in the terrain known as Pilgrim Hill. It got its name in 1885 when a the bronze figure of a Puritan, staring into the distance with his right hand resting on the muzzle of his flintlock beside him, was placed there. This Pilgrim seems to be making his progress through the flowering Callery Pear trees of the park. Pilgrim Hill is a favorite spot for sledding in Central Park. 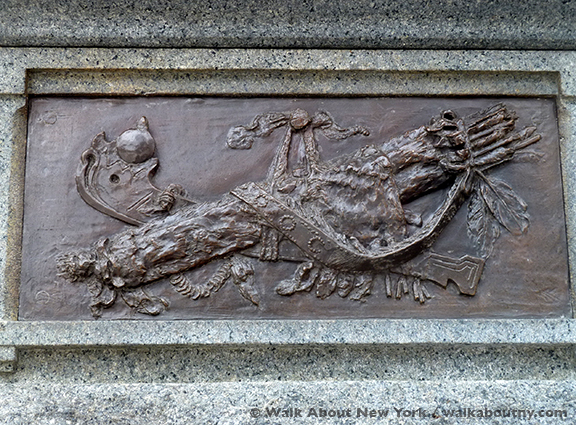 To celebrate the 75th year of its founding, the New England Society of New York commissioned Mr. Ward to create a bronze monument to honor America’s early colonists, the Pilgrims. The presidents of the Metropolitan Museum of Art, the National Academy of Design and the New York Chapter of the American Institute of Architects sent letters to the Central Park Commissioners urging that Mr. Ward’s bronze be accepted. On Wednesday, the 17th of December 1884 the Central Park Commissioners voted to accept the gift of the monument. The bronze and granite monument was unveiled on June 6, 1885. John Quincy Adams Ward personally unveiled his work of art, one of four of his bronzes in the Park. The ceremony began at 2:00 PM when 225 members of the New England Society, accompanied by the Seventh Regiment Veterans, marched 20 blocks up Fifth Avenue to the 72nd Street entrance to the park. The New-York Tribune reported the following, “His work was received with every expression of appreciation.” The work was conserved in 1979. We will never know why George Bessendorf, a German immigrant, chose the site of The Pilgrim for a murder-suicide four months after it was dedicated. On October 3 he and a woman named Maria, spread a rough, black blanket on the grass. They wore their Sunday best; Maria seemed dressed for her own funeral. Like Maria, George was dressed in his best black suit and a derby hat. At 7:30 PM, William Dugan, a policeman whose beat was Central Park, heard pistol shots that came from the direction of The Pilgrim; he hurried to that area of the park. George Bessendorf and Maria were dead on the blanket. Beside them sat a collar box with a label that read, “To the Coroner of the City of New York.” Inside were letters; some concerning George’s respectability, other were love letters from him to Maria. In several of them he acknowledged he expressed regret for the ruin he had brought up Maria. For this reason the couple believed suicide as the only way out. The bodies were removed to the Arsenal in Central Park, where it was observed that Maria had been careful not to damage her dress. A New York City police captain named Donovan speculated that she “had evidently opened her clothing and bared her breast to be shot. The skin was blackened and burned by powder marks, but the clothing was only marked with blood. Two bullet holes were in the body, one in the left breast and one in the right.” It is thought that George buttoned her dress after having shot the woman he loved. He then turned the pistol on himself, shooting himself in the chest. He held the pistol so close to his body that his clothes were burning when Policeman Dugan arrived. This is an early and sad chapter for The Pilgrim; it stands in stark contrast to the lovely, flowering surroundings shown here, and that will soon be seen on Pilgrim Hill. 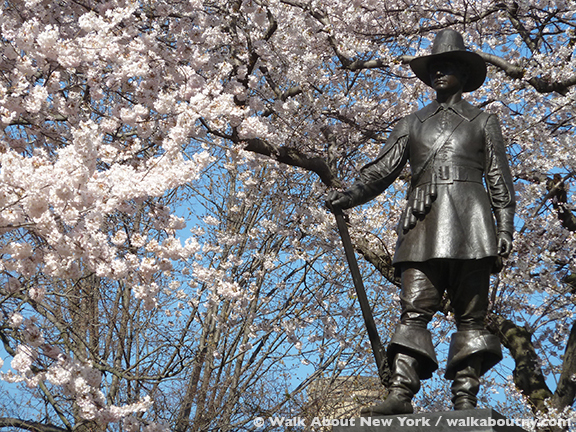 Read about and see photos of Central Park’s Hamilton Memorial amid springtime flowering trees here.